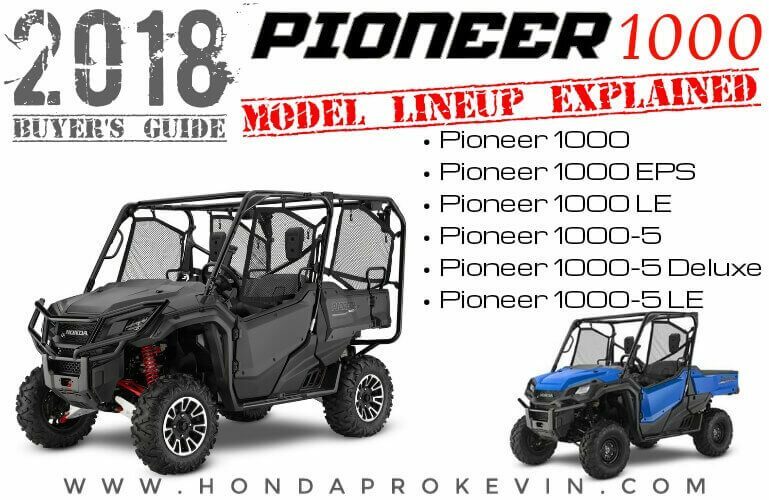 Confused by all of the different 2018 Honda Pioneer 1000 and Pioneer 1000-5 models? If so, you’re not the only one… I deal with this topic daily as many and I do mean many people just aren’t sure about exactly what is difference between all (3) different 2018 Pioneer 1000 models and same goes for the (3) different 2018 Pioneer 1000-5 models. Many are still confused and thrown for a loop as to what the “5” means in the model name: Pioneer 1000-5. 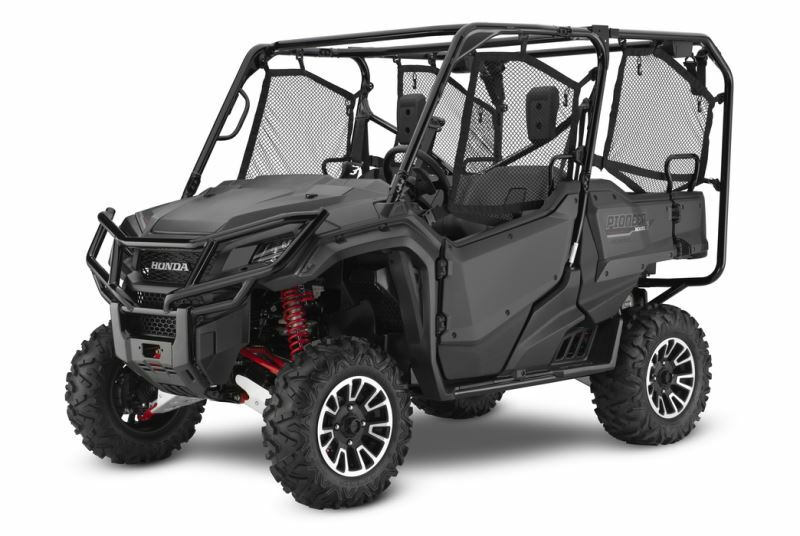 Before we dive in too deep and I get sidetracked… Would you guys like to see a “2018 Honda Pioneer 700 + 500 Model Lineup / Differences Explained” post similar to this? If you guys find any of this info helpful, please slap that “like” button and or share as it lets me know you guys like these types of posts so I know whether or not to do more of these in the future. Thanks guys! Seating | How many seats does each Pioneer have? First off we’ll start with the easiest part and that is seating options and which models have X amount of seats etc. It’s really easy once you pay attention to the details in each of the model’s names. 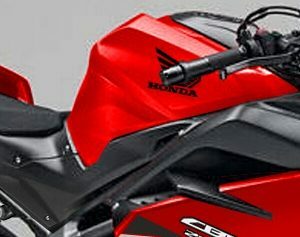 So as you can see above, if the model name just has “1000” in it then you have a 3-seater side by side. Next up, we have the Pioneer 1000-5 models and the “5” in the model name is telling you that it has seating for up to 5 people. QuickFlip Seating | Which modes have seats in the bed that fold up and down? Electric Power Steering (EPS) | Which models don’t have EPS? 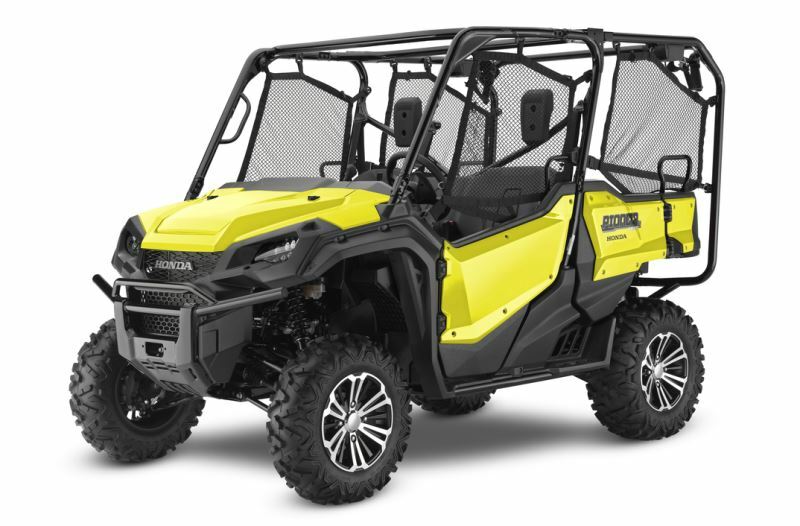 Automatic / Manual Modes with Paddle-Shifters and Sport Mode | Which Pioneer 1000 models come with the Sport button and the ability to go from Manual to Automatic with Paddle-Shifters? I-4WD System | Which Pioneer 1000 models have Intelligent four-wheel drive? 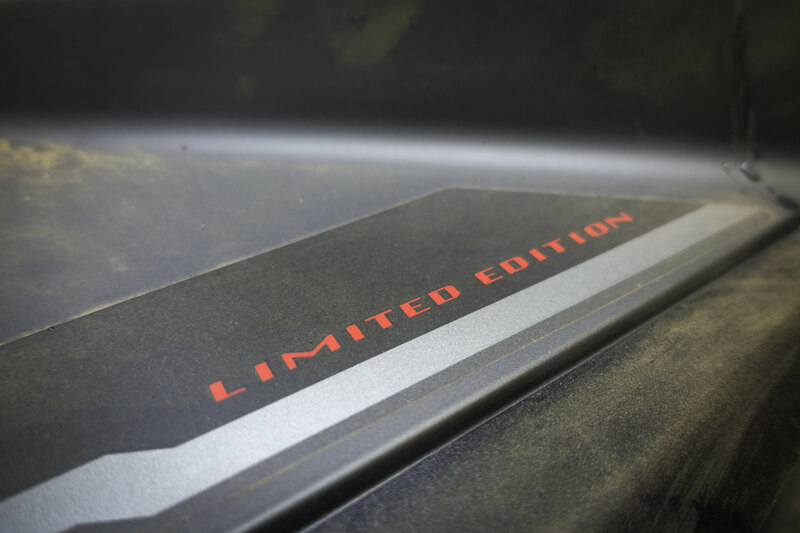 If you’re not familiar with the awesome technology behind the All-New I-4WD system that Honda introduced last year for the Pioneer 1000 LE models, make sure you CLICK HERE to read all of the nitty-gritty details you NEED to know about the system before you mark it off your list. Is the I-4WD system for everyone? Nope. Actually, there are going to be a lot of people that don’t want it but there’s going to be a ton of people that love it once they give it a try. Manual Differential Lock | Which Pioneer 1000 models have a manual differential lock? To some people having not having a manual diff-lock on their 2018 Pioneer 1000 like the LE (Limited Edition) models above with I-4WD could be a deal breaker so thankfully you still have an option and that is the models listed below. 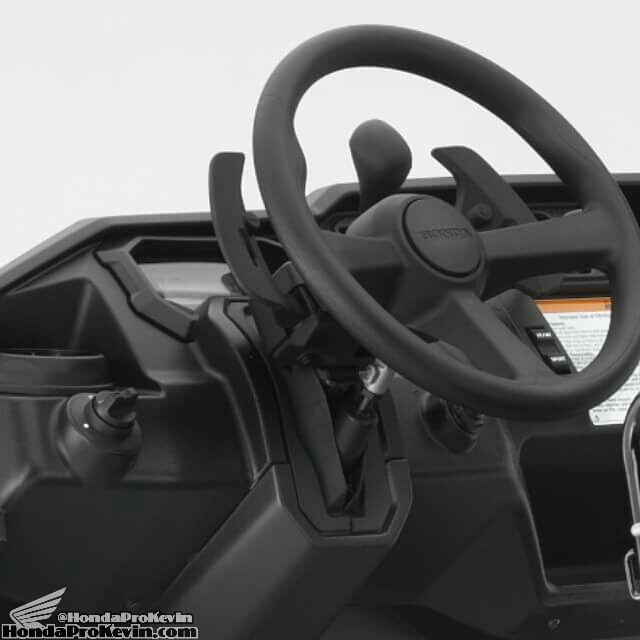 Tilt Steering Wheel | Which Pioneer 1000 models have a tilt steering wheel? LED Headlights | Which models have LED headlights? Aluminum Wheels | Which Pioneer 1000 models have aluminum wheels? 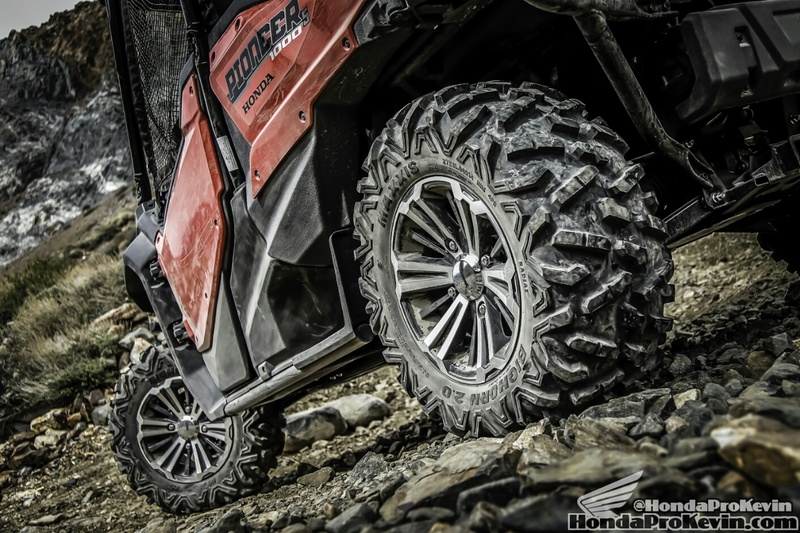 Maxxis Big Horn 2.0 Tires | Which Pioneer 1000 models come with the upgraded Maxxis tires? 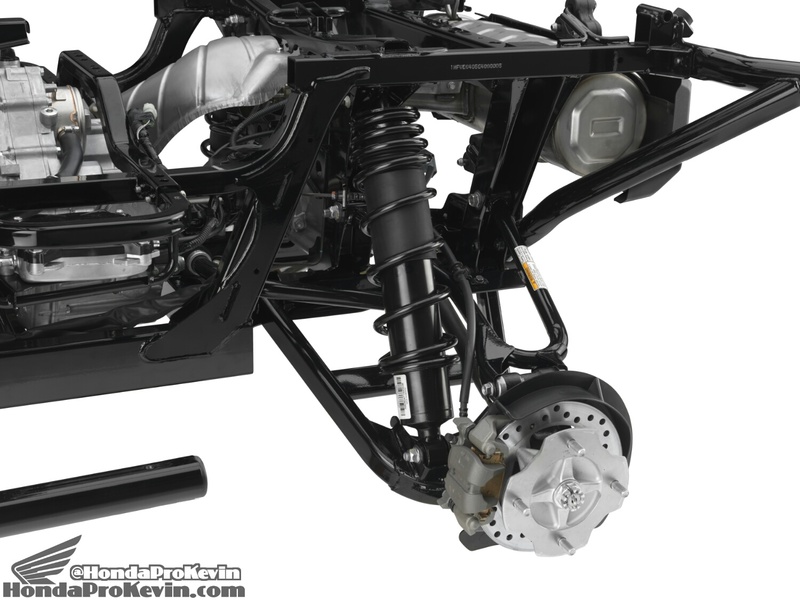 Load Leveling Rear Suspension | Which Pioneer 1000 models come with the self load leveling rear suspension? 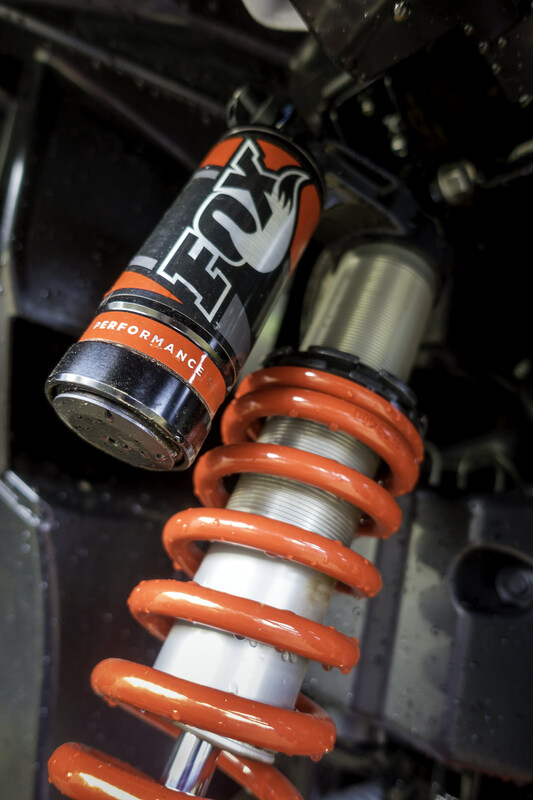 FOX Suspension | Which Pioneer 1000 models have FOX shocks? 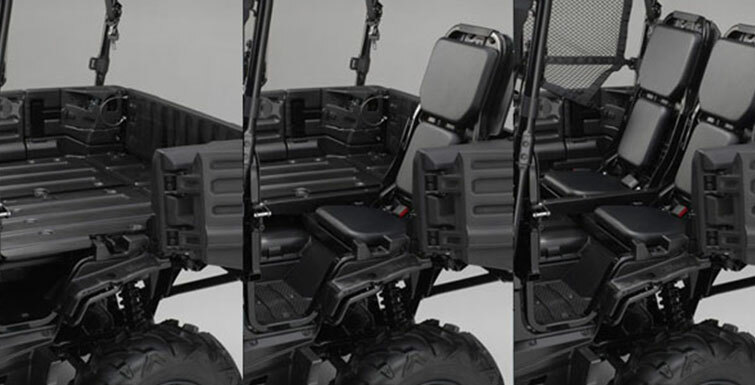 Painted Bodywork | Which Pioneer 1000 models come with painted plastics? Pioneer 1000 Speed / Acceleration | Which 1000cc Pioneer is the fastest? Since there’s a lot of variables when it comes to racing with human error etc, it would be quite the task to get a perfect race lined up between all (6) different 2018 Pioneer 1000 models… So let’s do the next best thing! 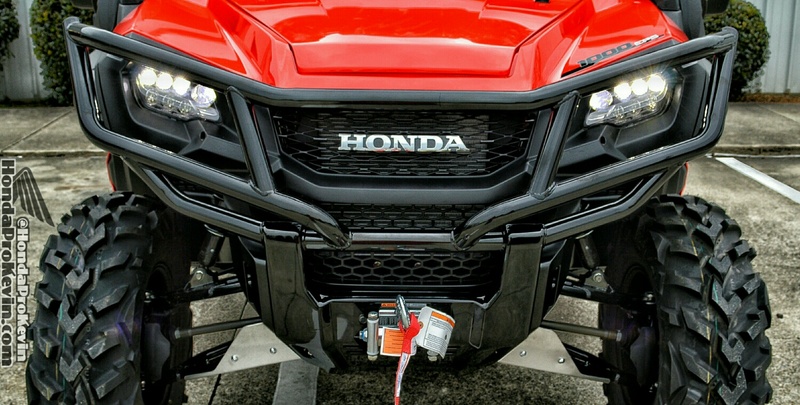 We’ll compare their power-to-weight ratios between them and that will answer the question as to which one of the big dog side by side UTV models are fastest from Honda for 2018. The fact that they all have the same gearing and horsepower does help make this comparison easier than it would be if we were comparing two conpletely different models like the 2018 RZR 1000 Turbo versus the Pioneer 1000 haha. For one that’s not a race really as they are two entirely different machines with different purposes but I just wanted to use it as an example as to why comparing these numbers are ‘easy’ unlike what it would be against those other two models since they’ll have different gearing, horsepower and torque numbers just to name a few that keep you from being able to do such an easy and accurate comparison like we can on the Pioneer 1000 model lineup. Anyways, enough of the rambling is what I’m sure you’re saying so let’s get to those numbers below. 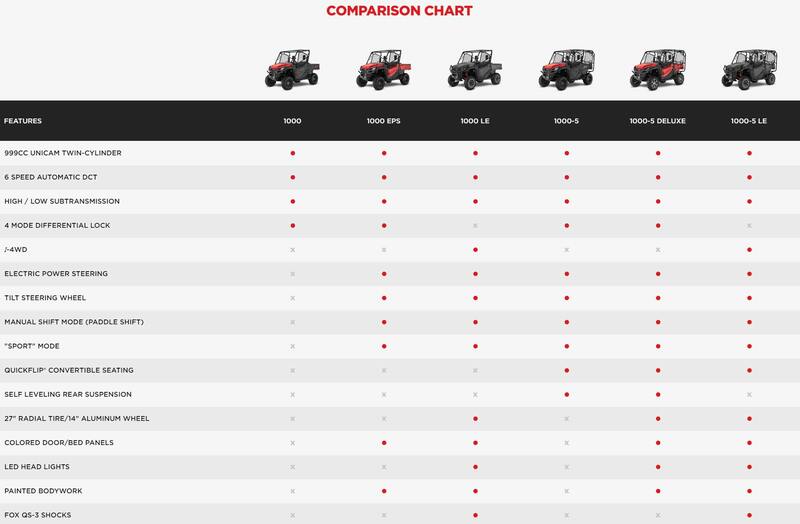 There’s a few other misc differences between all of the 2018 Pioneer 1000 and 1000-5 models that I didn’t break down above but that’s where the comparison chart below comes in handy too. * Click on it to enlarge the chart to better see the details.